Bambi wasn’t the first Disney feature to utilize multi-plane backdrops (that was Snow White), but it is almost certainly the best. The depth of the forest is critical to creating a realistic and stunningly beautiful world for Bambi to romp and play in. Every branch, every leaf, and every tree trunk are flawlessly integrated with the animation. There’s color too, Bambi not sticking to just traditional earth-tones, but a wealth of greens, yellows, and oranges. Beauty is imperative, Bambi’s never seen villain, Man, destroying the natural beauty of this forest paradise. The AFI even ranked Man as one of the screen’s greatest villains, a choice that is difficult to argue with given the portrayal here. This is challenging material for kids, not focusing on a traditional narrative. Bambi is a story of life, the title character growing up, suffering loss, and finding himself “Twitterpated,” a word that seems even more relevant here in 2011 (if for different reasons). It’s still pure Disney though, relentless perfectionism and staggering detail. Watch as the Owl reveals the concept of being Twitterpated, spinning and floating in a way that aside from some minor anthropomorphic movements, is still very much like an owl. He spins on a branch, twists his head, and has those eyes that demand attention. More importantly, all of the animals act like animals. Four-legged critters stand on their hind ends when necessary, and only temporarily. Bambi moves like a deer, and sit down cautiously. He’s spooked by the thunder, and curious about rain. 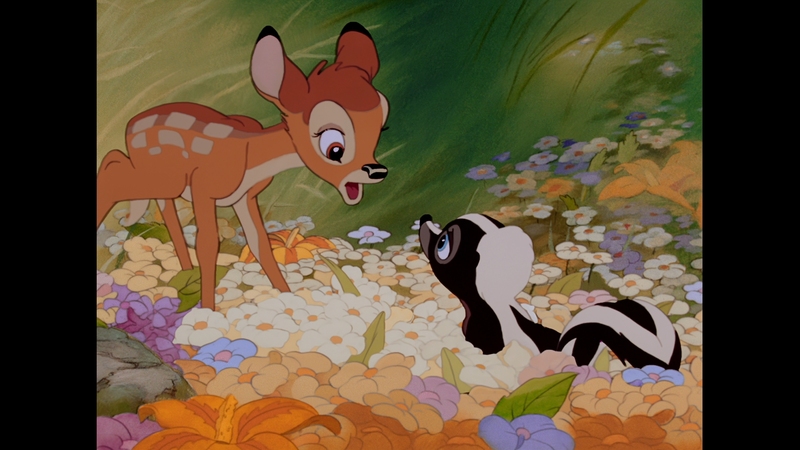 The expressions are meticulous, and the feelings generated from nothing but color as the inevitable happens to Bambi’s mother ensure masterpiece status. Disney again scores with another one of their animated classics, continuing their dominance with regards to animation. Anything that can be stated in regards to Alice in Wonderland or Snow White applies here. Age means nothing. It makes it all the easier to appreciate the wealth of work that created those striking backdrops. The fine brush strokes are clearly visible, and the focal effect is stronger than ever. Tree bark looks like bark, and the grassy meadow is awe-inspiring in its beauty. Fine lines of the animation itself are also preserved to the fullest extent, the slightest of flaws again visible. Broken lines or a bit of bleeding color gives the animation a natural quality, marks that mean it was touched by actual human hands. This AVC encode from Disney keeps it all intact. Motion, no matter how complex or frantic, remains free from any digital faults. Falling snow and the rush to move from the interior of the land as the fire swells makes for plenty of opportunity for it all to falter. Colors are bright and lightly saturated, certainly heftier than they have been before. Nothing feels out of place, much like the carefully applied use of noise reduction. The effect is transparent to the original animated cells. The audio is where Bambi bucks the trend for Disney’s Diamond Editions, sticking the disc with a DTS-HD HR 7.1 track at a stable 2.0 Mbps. The reason is clear, a 50 GB disc saddled with nearly enough content to fill the whole thing. That’s still not an excuse, as we’re buying the film (yet again) for the core feature. If extras are impeding on that experience, move them to a second disc. Despite the debate over codec choice, Bambi still sounds exceptional. Short of blind tests, finding differences between HR and straight DTS-HD would be difficult for the majority of viewers, although that’s still not an excuse. The musical score loses most of its oomph on the high end where clarity just isn’t there like it has been in the past with Disney features. Separation between the elements is rather poor, lyrics at times almost lost. That said, the melodies should have a natural, almost ethereal quality to them and that’s retained. Dialogue is fairly soft, but not offensively so. This is almost a benefit to the feature, aiding the character’s friendly nature. The surrounds exist to hold the music and not much else, sound effects sticking to the center, preserving their original mono qualities. The faults cannot squarely be aimed at the codec choice; it’s just not that simple. This is a feature from 1942, and it’s far more difficult to retain audio detail as opposed to film’s already high natural resolution. Regardless, let’s hope this isn’t a trend. Walt’s Story Meeting is the disc’s pop-up feature, an outstanding bit of insight into the film’s production. Voice overs, sketches, and interviews take over the entire running time with care, and additional interactive choices branch off of those. Two deleted scenes include an additional song number, and Twitterpated is given a musical backdrop. Interactive galleries are simply staggering in their wealth of reference material. Disney’s Big Book of Knowledge is one for the kids, detailing forest animals and containing a few games. The rest is pulled from the DVD editions, including two more deleted scenes, an hour long six-part making-of, vintage feature on the multi-plane camera set-up, cartoon short, and a look inside the Disney Archives. Trailers remain.